T.D.O.T. 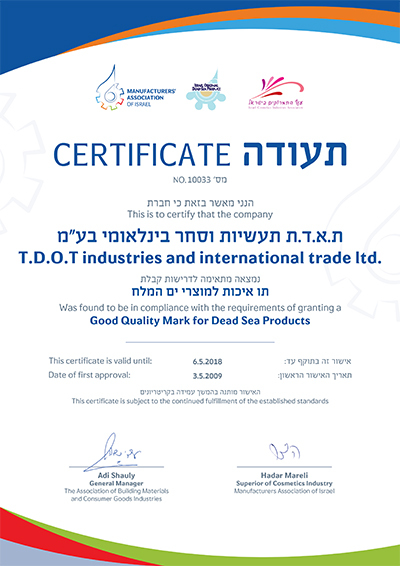 Industries Int'l Trade Ltd was established in 1999 using the Trade name Dead Sea Cosmetics. 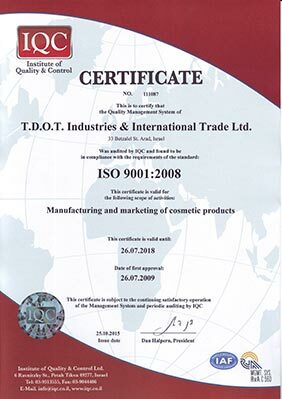 Specializing in innovative & advanced skin-care cosmetic products formulated from the unique salts, mud & minerals of the Dead Sea, it is the policy of T.D.O.T. to supply cosmetic products that are of the highest possible quality, made with choice natural ingredients, chosen for their environmentally friendly properties and in line with all the latest consumer trends. None of the products offered are tested on animals or contain animal derivatives. The raw natural elements of the Dead Sea have lo'g been renowned for their curative and therapeutic properties and in 2001, T.D.O.T. began manufacturing & marketing their own lines of beauty and skin-care products based upon these ingredients by carefully combining the rejuvenating minerals of the Dead Sea and it's region with aromatic oils and natural plant extracts. Under the label of Intensive SPA, there is an excess of 120 unique, quality skin-care products that are formulated from the best ingredients that nature has to offer. T.D.O.T. are committed to the pursuit of excellence in the manufacture of skin care cosmetic products and the emphasis is, as always to continue to strive to provide the highest levels of product innovation, quality & customer satisfaction. 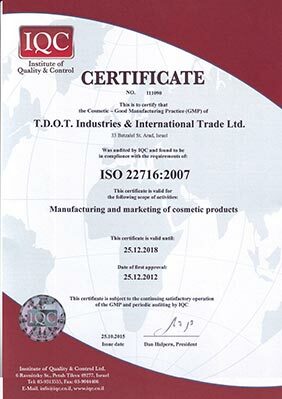 We are proud to announce that after upgrading our certification standards, T.D.O.T. 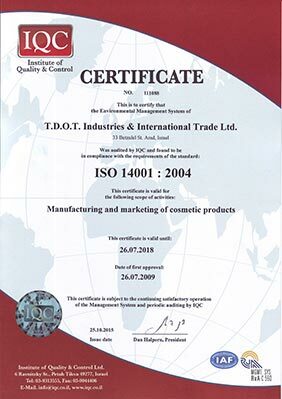 has been awarded ISO 9001:2008, ISO 14001:2004, & HACCP (including GMP) for the manufacturing & marketing of cosmetic products. This certification ensures that levels of quality, environmental management, product safety & good manufacturing practice are upheld to the very highest of standards. In addition to supplying a wide range of products to private customers, retail stores & cosmetic wholesalers - T.D.O.T. supplies Professional Spa Size products to Spas, Health Care Centers, Hotels and Resorts throughout the world. T.D.O.T. is also proud to offer an extensive range of Dead Sea products and a selection of the highest quality professional packaging & labeling to suit each client's individual Private Label specifications and budgetary requirements. T.D.O.T. maintains a logistical center in the United States where our high end cosmetic line, AVANI - www.avani-deadsea.com is distributed. AVANI is an advanced cosmetic line based on Dead Sea minerals combined with the latest ingredient innovations. This center was also established to facilitate the shipment of thousands of orders for Dead Sea cosmetics each year. Moreover, T.D.O.T. is the owner and operator of two successful on-line stores; www.deadsea-cosmetics.com which was established in 1999 and www.deadsea-mall.com in 2007. Via these websites T.D.O.T. has brought the wonders of the Dead Sea into the homes of thousands of consumers worldwide. Offering all the major brands of Dead Sea Cosmetics, T.D.O.T. offers exceptional variety, quality, service & value for money, earning the company thousands of loyal customers worldwide and the envious position of the No. 1 websites in its field. Click here to download our Social Responsibility - Code of Conduct pdf file.